The admiral stood on the bridge of the first of Type 003 aircraft carrier, the Sichuan. She was the pride of the People’s Liberation Army Navy fleet, advertised as a domestic design, her plans were largely based on the Gerald R. Ford Class schematics and the aircraft that she tended were remarkably similar to the F-35. Beijing had staged an attack on some Chinese tourists on the islands and publicly clamored for a United Nations response to end the violence. Conveniently, the PLAN amphibious group had been exercising in the nearby Scarborough Shoal and was tasked by Beijing with ‘evacuating all Chinese nationals.’ Of course they would need to use the airport for this. And their evacuation aircraft would need security in the form of ground troops. He knew the Philippines wouldn’t resist. His intelligence officers said the Americans had sent one of their new Marine battalions but he wasn’t worried. He had missed the fleet action in the in the Great Pacific War. But on the way home from Sri Lanka his ship had caught the Marine Ospreys over the open ocean sortieing from Okinawa. He had given the order not to stop for survivors. Major Charles Elrod climbed out of the UTV II, an electric version of the Polaris MRZR with a mission module on the back. In this case a launcher for the new anti-ship missile. The company had about two-dozen launchers and laser batteries that could be fired from the UTVs or set up to fire dismounted. They had left their heavier missiles, mounted on JLTVs behind. He looked out to sea – Good weather. Perfect for a landing. They’re more afraid of a typhoon than they are of us. This matched the Defense Battalion’s S-2 estimate. He looked down at his tablet – all of his launchers glowed green. A good sign, they haven’t been able to find and disrupt our network yet. Regardless, his wiremen had already laid the cables that connected launchers to the G/ATOR radars in case the network failed. The missiles could be fired at any grid in a 200km range and search for their own targets with a combination of LIDAR and radar, but it helped if someone found the targets first. He could even see the minefield the Naval Detachment had laid. I’m not sure if you can call them mines if they can lay themselves and hunt for their own targets. He was anxious, this would be the first time one of the new Marine Defense Battalions saw combat. 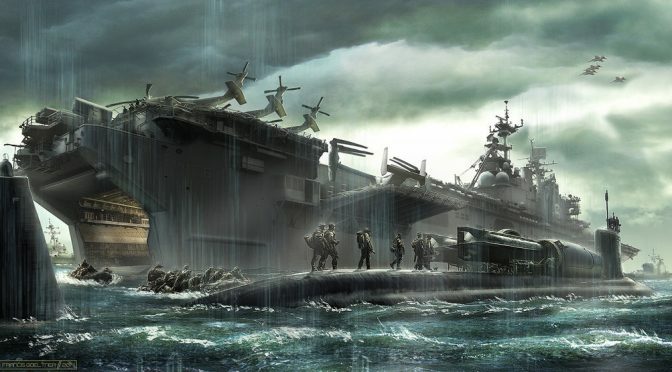 It would be the first time U.S. forces would fight the Chinese after the disaster that was the Great Pacific War in 2025. Everyone thought the new Chinese Islands would be the flashpoint – but it was the subsea cables. America’s military had been humiliated by the Chinese and ceded any pretense of control over the South China Sea in the Manila Accords. The Navy bore most of the fallout – and saw the largest culling of their senior officer corps since World War II. Hopefully it was enough. Those guys were still wide-eyed during the Congressional inquiries. The Marine Corps had largely sat on the sidelines after giving tactical control of its fighter aircraft to the sister service. All of 3rd Marine Division just sitting there waiting. What a waste. Until the Marines made a hasty, 11th hour heliborne assault from Okinawa. They retired their colors. Should have given the Colonel a posthumous court martial instead of a Medal of Honor. The Corps’ new Expeditionary Advanced Base Doctrine was air-centric, problematic for a force that built itself around squads and platoons of riflemen. They had all but abrogated their Title 10 mission to prepare for the “seizure or defense of advanced naval bases,” consistently prioritizing the small wars of the Middle East over the Pacific. We got lots of training on IEDs but none on cyber or EW. The loss… not that anyone called it that… had spurred a sweeping reorganization in the service. After scrapping the failed Expeditionary Advanced Base Operations concept they went back to their roots and reorganized eight infantry battalions into Marine Defense Battalions, an old concept from the first half of the 20th Century. The goal of the Defense Battalion was to free up the fleet for action elsewhere – if it had to dedicate its resources to protecting bases it had less to dedicate to fleet action. Made up of Air, Sea and Land Defense Companies with Sensor & Network Company, they were a marriage of the best missile technology available, a remote and autonomous sensing capability, and interoperability with Naval and Air Force sensing and strike capability shepherded by a distributed anti-access, area denial doctrine. Similar concepts like ‘warbot companies’ had been discussed for years never adopted. After the war the generals picked a small group of junior officers and tasked them with reforming the Corps. Eschewing the tyranny of Quantico they worked out of an office in San Francisco. They drew on long forgotten letters by Pete Ellis about the defense of advanced bases and base denial and they visited engineering labs in Silicon Valley and Mountain View before sending fresh requirements to Raytheon and Boeing for a new generation of anti-air and anti-ship missiles. I’m still surprised those companies survived telling Congress that they couldn’t meet the missile orders. I guess they figured it out. The new weapons had come just in time. Elrod’s men had been practicing in California with the old Stinger I missiles until a month ago when the new Stinger II missiles arrived. A transfer from the Marine Corps’ Low Altitude Air Defense community, Major Elrod had been skeptical of the new weapons. Man portable, but not man launched? Lasers? But the drills on San Clemente Island had him convinced. He needed half as many men as his old LAAD unit, and after setting up the launchers and networking them with the radars up he didn’t need any. They could track and fire on the Chinese autonomously. He cringed when he thought about the debates over autonomous weapons. We were debating the morality while our enemies were testing these weapons in Syria and Sri Lanka. We gave them a ten-year head start. His tablet pinged. One of the MUX drones had found a Chinese Coast Guard cutter. Probably a picket for the amphibs. Worth sinking? The MUX thought so. Elrod watched his tablet as the MUX sent orders to three of the new Fast Combat Vessels hiding out in a cove. It was able to use the new light-based LOS communication suite to transmit nearly instantaneously, and it was un-jammable. The egg-heads said it worked just like fiber optic cable – but without the cable. They sortied and quickly and raced to their separate launch points at over 90 knots. The boats were a hybrid American/Swedish design. The MUX had picked three different points for them to fire their missiles that were just beyond the radar range of the ship. The separate firing points would send the missiles in a way they would approach the Chinese ship from three different directions and overwhelm its close defense gun and leave the amphibs wondering where the missiles came from. Damn, those drones are smart. He looked up for a second before he realized all of the action would be well beyond the horizon. The most potent new weapon fielded by the Marines wasn’t organic to the Defense Battalion. It was the MUX drone flow by VMU-9 in support of the battalion. The MUX, without any weapons of its own, is the eyes and ears of the Defense Battalion. Sortieing hundreds of kilometers off the coast to identify and track targets for the battalion to prosecute with their own fires or fires from sister services. Elrod remembered when the Corps had reestablished up the small boat units that it used in Iraq. Oh how the Navy had fought to keep the Marines out of the boat business. The services had finally fought to a draw – it became a joint program with Sailors driving and Marines manning the guns. The boats, without the new missiles, had already proven themselves when the Marines deployed to help Indonesian security forces fight a resurgent Islamic State in South East Asia. Damn that was a nasty war, and still not over. But Elrod had watched that conflict from the sidelines – choosing to specialize in the larger anti-aircraft missiles over the smaller gun and directed energy air-defense platforms that the Corps deployed to counter the UAS threat. He was ready for his chance at combat after watching his buddies in the drone defense units deploy on back-to-back tours. The battalion’s focus was on destroying connectors – whether seaborne or airborne. Killing whatever has the soldiers on it. And the Navy focused on the capital vessels. The sun was beginning to set, and Elrod sat down and leaned against the UTV. His Chief Programmer, Chief Warrant Officer Two Alexa Abbas, a 22-year old MIT graduate, was still typing away, finishing the last inputs to the parameters for the missiles. When she was done Major Elrod would set the system to be fully autonomous, otherwise the system would still need his permission to fire. She had volunteered for a direct accession into the Marines as a Warrant Officer under a new program that targeted people with critical skills, allowing them to move laterally into the force and skip some or all of the normal training pipeline. She was the senior programmer in the company, responsible for making sure all of the software worked as is was supposed to and that the Marines’ network was secure from the Chinese. The Great Pacific War had taught the Marines how vulnerable their networks were – on the first day only 10 percent of the F-35s in Japan were free from cyber intrusion. But many of the pilots decided to fly anyway. Most didn’t live to repeat that mistake. It was the civilian networks that suffered the worst. San Diego was without power for all 12 days of the war and the loss of cell phone service to military bases meant that their response to the crisis was in slow motion. All that talk about the ‘Ghost Fleet’ in Suisun Bay – there was never time. The driver, Lance Corporal Alan Gomez, ran through his checks of the communications equipment again. He had been 14 when the last war started. He remembered getting out of school early and waiting for his mom to pick him up. It was late evening before she came because all of the traffic lights were out in LA. But mostly he remembered the riots that started the next day. He had enlisted with his parent’s permission at 17. He wanted to go into the infantry but he didn’t have the scores required for one of the new Assault Battalions. But he did qualify for the Defense Battalion. He was surprised to find out the training pipeline was 18 months long for the new infantry. He would attend training for driving, communications, and field medicine training before he would go to the six-month basic infantry skills course. It was around 4am when the island lit up. Major Elrod awoke with a start. Is this what it feels like to get bombed? But he quickly realized the ordnance was outgoing. He looked skyward, joining his driver and Chief Programmer. Hundreds of missiles streaked skyward, lighting up the dark night. There were more missiles firing from over the horizon. Must be from the Navy. He looked at his tablet. The MUX drones had identified the Chinese fleet earlier, but they waited until the Navy’s subsurface drones made sure they found all of the Chinese submarines before they fired. The Navy was still stinging from the losses they had suffered in the last war at the hands of cheap diesel electric submarines. They were just waiting for us. How did we not see? He watched the tablet, imagining the Chinese sailors react to the hundreds of missiles streaking toward them. Many would be shot down – first by other missiles and then by the close-in defense guns. More would be absorbed by the merchant and fishing vessels sailing with the fleet. But the Marine missiles carried countermeasures of their own. And they would fly together in formations, coordinating their flight paths to optimize their effects on target and confuse the Chinese defenses. Inevitably some would make it through, and then others would exploit the gaps in the fleet defenses to strike the ships at the center of the formation. The enemy ship indicators on the tablet started to disappear. Elrod could now see the dim glow over the horizon of the burning fleet. This is for the John C. Stennis and the John F. Kennedy. After two decades of fait accompli aggression the president outlined a new policy of preemption and escalation in a speech at Annapolis, new weapons alone could not effectively counter aggression. The Chinese fleet ostensibly sailing to evacuate Chinese citizens was the first victim. The president had decided that 15,000 Chinese soldiers weren’t needed to protect a few dozen tourists and he wouldn’t wait until after it was a clear act of aggression. So he sent in the Marines. 1stLt Walker D. Mills is a Marine Corps infantry officer. He is currently a student at the Defense Language Institute in Monterey, California. Featured Image: “Ready for War” by FranzowaR.